CDComics, that’s comics on CDrom locally and my name’s Craig Daley, so the name was pretty inevitable. 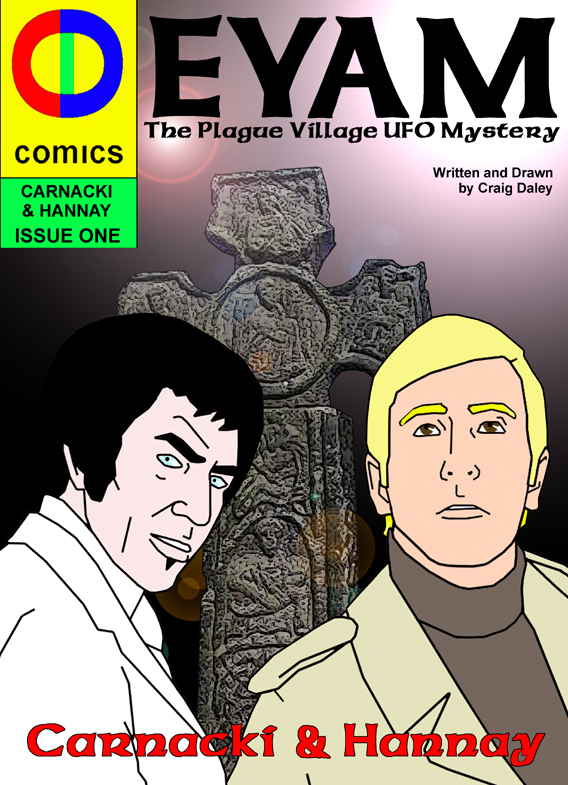 I’m based in Sheffield UK and the CDrom comics are available in several local shops and since January 2012 they have also been available to download off the Internet. At the moment there are 11 digital download CDComics on the market, that’s three issues of ‘Manhattan 1930: The Man in the White Suit’. 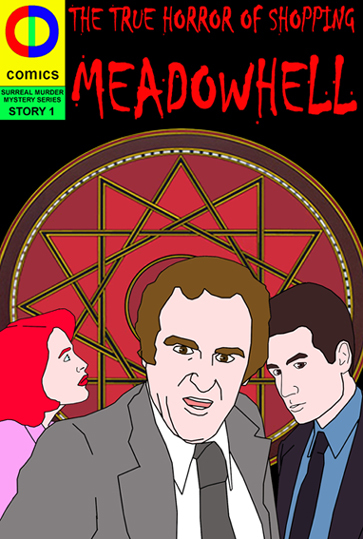 Three macabre horror narratives all two issues long, from the Surreal Murder Mystery series, that’s ‘Meadowhell: The True Horror of Shopping’, ‘Spring Heeled Jack: Form the Tunnels of Hell’ and ‘Football Crazy: The Theatre of Nightmares on the Road to Insanity’. Plus the first issues of two revamped domain free characters, ‘War Nurse’, a WWII British heroine who fights Nazis and ‘Carnacki & Hannay’, that’s Carnacki, the Ghost Hunter and Richard Hannay, the prototype for James Bond, who are having a Roswell type experience. My scatological approach is one of the reasons I still produce comics on CDrom locally. Dave, the owner of the Sheffield Space Centre comic shop asks what I’m doing next and I tell him and give him a release date, which pushes one of the projects to the front and gives me a solid deadline. So, in January 2013, CDComics will be releasing ‘Robin Hood 2020’, it’s a highly political retelling of the old legend. He’s stealing from the rich to give to the poor, it’s the bankers, politicians, big business and the aristocracy that are his and his Merry Men’s victims, it’s turning into a bit of a left wing rant actually… But should be fun if you like seeing Old Etonians getting what they deserve, I’m not referring to inherited wealth, a post in the Government’s Cabinet, huge expense accounts, pay offs or the job of Lord Major of London. I produced local fanzine style comics back in the 70’s and 80’s, they were basic b/w photocopies and I sold them through Dave, the owner of the Sheffield Space Centre comic shop, but always ended up with some left and losing money. Then after a thirty year gap, during which time, I taught Art, Media and Graphics and worked as a cartoonists for a national music magazine, I’ve returned to doing a bit of self-publishing again for fun. I now run a small design business with my partner/wife, JaS Design and my self imposed condition was that I didn’t loose money, which is the main reason I went digital. In late 2010, I released part one of ‘Manhattan 1930’ on CDrom, supplying the Space Centre with five copies, when they sold I printed out another five sleeves and burnt five more CDs, no print runs, no outlay, no real cost. I now burn comics as the seven shops that now stock my CDComics ask for restocks and print up covers for the DVD cases I package them in on demand. By March 2011, I reached triple figure sales on CDrom titles locally and saw the Internet and download websites as the natural next step and just went for it. I got my comics on Amazon, Drive Thru Comics and Sony, Apple, Diesel, Nook, etc, via Smashwords, which again means no print runs, no outlay, no real cost. I ran CDComics first product, Manhattan 1930 as a webcomic for a few months releasing three pages per week, which was mainly done as an advertising ploy to attract readers to my other comics, but to be honest my narratives don’t really suit that format. The webcomics I enjoy are written for purpose and best suited to short comic strip style narratives, similar to ‘The Jerks’ strip I wrote and drew for ‘Making Music’ back in the 90’s. For me it’s ‘Andy Capp’ and ‘Perishers’ territory and brilliant when done well, but I wanted to get back into writing longer format narratives. All my comics were written and drawn to be read using digital means, whether that’s desktop, tablet or smartphone and I think once you have decided that, they work as a concept. The large size of the lettering and the relatively flat colouring of my comics is all targeted at the format of smaller digital devices, but sometimes comics that were intended for print or were originally print don’t really work. I can’t imagine reading an art master class like Arkham Asylum on a smartphone, it needs to viewed in its original intended form and some digital comics do seem to fall into that trap, the art is great, but is it really what the audience want on a small backlit screen. I hope not, there’s nothing like the smell of a classic Lee and Kirby, but that could be my age talking. I prefer reading print comics, but I’m not in my teens, twenties or even thirties and the world moves on and so am I, but I personally wouldn’t like to see print comics disappear, although I think it will happen. The bigger companies are offering downloads with print versions and Drive Thru, offer a print service to self-publishers, but I’m not really sure there needs to be as much cross pollination between to two formats. I have been asked to produce print copies of my comics, but mine were written and drawn to be viewed on a backlit screen, not paper. CDComics probably won’t be going into print, they are and were always intended to be digital and again it’s about cost and print runs…If they did they would be best in an A5 format, again this relates to their original purpose and screen size, don’t get me wrong, if somebody else wanted to pay for the print run and take my comics to a wider readership, I would bite their hand off…I’m not precious. The reading experience is fine, but for me it’s not the same as reading a paper comic although I am restricted to reading on PC. Slightly disappointed by some of the attitudes that exist within some of the comic book forums, the closed shop mentality of some of the creative people involved, you have to like, follow, friend us and go to Comic Cons or we won’t let you play with our ball. The digital media should have created an open market, like it did in the music industry in Britain before the big companies gained contorl, but in comics the forums appear to have self appointed gatekeepers that are rather blinkered. This year zombies, next year possession, yes we all know it’s coming, but do we really have to jump to the call of the US market. I don’t regular read a particular webcomic and more often than not, just leap around from one title the next. The short format of the webcomic struggles to grab my continued interest and the short strips are something that can be read as one offs, the best ‘Andy Capps’ I read were the first five or six. Archewood, Piled Higher and Deeper, Garfield minus Garfield, but the problem with these and the market for me, is there are so many I often find myself reading those known to the print media or that get to the top of the Google list. I have the same problem with Digital Comics, Comixology and the Walking Dead, I read digitally, Irredeemable as well, but more indie titles that have caught my eye are ‘The Continentals’ by Hughes and McNaughton and Super Massive Black Hole by Smbhax, but my view changes from week to week as I see something new. I think that’s another reason I continue to try to target my comic books internationally, but also at a local market and sell them as CDroms in local shops as the Internet sometimes offers too much choice. They will probably replace paper comics and follow the book market into the digital age and the larger companies will further develop their grip on the market. Very quickly the big companies are getting in position to control the market and the big names will probably come from them, so if Smbhax or McNaughton and Hughes got discovered by Marvel, DC or Image, etc, then they will be discovered by the rest of us. “10 Questions With” is to be a interview session with digital comics creators – there’s a lot of great people I’ve got lined up and I hope you enjoy seeing what the creators are interested in. If you are a digital creator and am interested in participating, please contact me!